Home Magazine Columns Does Your Browser Need Updating? Biotech’s conservative approach to IT creates a problem for new web technologies. The biotech industry is quick to adopt new technologies that help drive its research, yet when it comes to the ubiquitous web browser, it lags far behind the norm. This poses a serious problem as a new wave of advanced web applications will simply not run on old browsers. Looking at the web server logs for a biotechnology-specific database revealed this striking discrepancy. Server logs were parsed to identify the web browser used in the latest page request for each of 200 unique users of the site during 2012. Microsoft Internet Explorer was the web browser of 53% of users, with Mozilla Firefox and Google Chrome both at 18% and Apple Safari at 11%, which is very close to usage across the Internet as a whole. Three versions of Internet Explorer (IE) were observed. 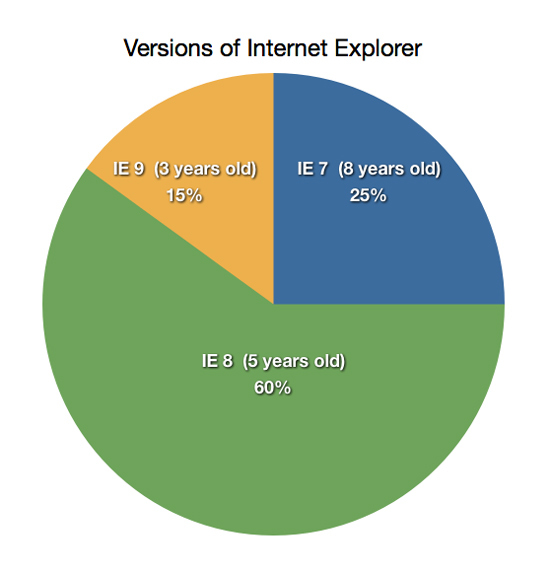 Version 9, which is three years old, accounted for 15% of IE users. Version 8, which is five years old, accounted for 60% while Version 7, released eight years ago, is still being used by 25% of IE users. No users of the current version 10, released in October 2012, were recorded. In other words, 85% of Internet Explorer users are using a browser that is two or more generations old. This corresponds to 45% of ALL the users of this site, markedly higher than the 34% seen across the Internet at large1. And yet people are clearly getting their work done using these browsers, so why is this an issue? The web is currently introducing a whole suite of new capabilities in the form of HTML5. Current versions of all major browsers can make full use of the technology, but on IE8 and older versions, the code will simply not run. HTML5 is the latest revision of the markup language and underlying technologies used to deliver content via the Web. It offers real advances in graphics, multimedia, local data storage, and performance, and it will form the basis of all new web applications for the next few years. For biotech, the promise of HTML5 lies in data visualization, from genome maps to sequence alignments, from microarrays to molecular graphics. For a software developer, the fact that 45% of potential users are unable to use your product is shocking. Outside of biotech, developers have overwhelmingly embraced the new features available in HTML5 and are not willing to create workarounds for old browsers. The clearest example of this came in November 2012 when Google, with all of its resources, discontinued support for IE8 and earlier across all of its Google Apps services2. The solution appears obvious—simply update to the latest version. But while updating on a home computer is a simple step, in a corporate environment, the IT department typically exercises strict control. They have very good reasons for this. They have to prevent malware from being installed, they need to ensure consistency throughout the organization, and they need to offer support for each new version. As a therapeutic moves into the clinic, IT must also ensure FDA 21 CFR 11 compliance3 for all hardware and software in use throughout the enterprise. These regulations require detailed documentation on all computer systems, with any changes being not only logged but validated—a process that is as expensive as it is tedious. Suddenly the simple act of clicking a button marked “Update” is not so simple. One way to deal with this dilemma is to isolate systems that fall under 21 CFR 11 control in their own network and allow more freedom outside that boundary. This can work in some cases but greatly increases the IT support required. The real solution is to ensure timely software updates across the board, be it for browsers or operating systems, and to deal efficiently with the regulatory requirements. This involves considerable effort and expense for the company, often for limited immediate benefit. But this is not a simple cost to be minimized on some spreadsheet. In research and development, there is a real opportunity cost involved in not staying current. The technologies that we deal with in biotech are advancing on all fronts. To slip behind in something so fundamental as a web browser is inexcusable. This pie chart shows the relative fraction of each Internet Explorer version used to access a biotechnology-specific database, according to its web server logs. 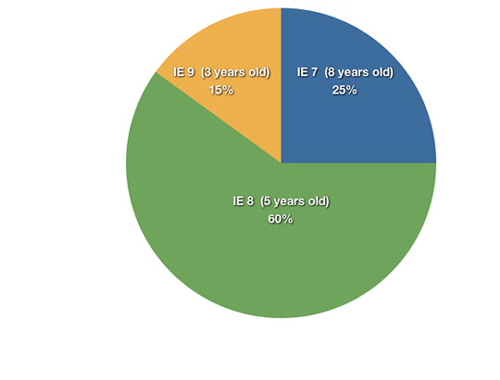 A majority (60%) still use IE8, which is currently five years old. Robert Jones, Ph.D., is the owner of Craic Computing, which develops bioinformatics and web applications for biotechnology companies.